We specialists in organizing Gokyo Renjola Pass Trekking holidays. Spectacular views are waiting for you in Gokyo Renjola Pass Trekking! Gokyo Renjola Pass Trekking is world famous walking holidays. Gokyo Renjola Pass Trekking is most popular trekking trail of Everest region. Gokyo Renjola Pass Trekking is the ideal destination for tourism in Nepal. Gokyo Renjola Pass Trekking is one of our popular adventure holidays. We offer special rates with best service on your Gokyo Renjola Pass Trekking. Trekking to Renjo La Pass offers an exciting experience. As a very popular and challenging trekking trail in the Everest Region, trekkers can have a spectacular mountain view while in trekking. They can also have a panoramic view of Khumbu Himal and challenging Renjo La Pass and explore the Tibetan valley from Thame side. The main attractions of the trek in the area include astonishing Gokyo Ri and a traverse of Renjo La Pass. The remote view of the Bhote Koshi River and the Gokyo valley is quite alluring. Enjoying the Sherpa hospitality, you will ascend through the rhododendron and conifer forest to the yak herders' settlements of sacred lakes of Gokyo and Gokyo Ri (5350 m) to savor the majestic views of Mt. Everest, Lhotse, Makalu, Cho-Oyu, and many more hovering in horizon. A traverse onto the Renjo La to the dramatic solitary Bhote Koshi valley put you on the historical trade route between Nepal and Tibet. An exploration towards the Nangpa Pass unveils unspoiled Himalayan scenery and the trickle of Tibetan refugees with their tragic plight. Expect to encounter Tibetan traders while retracing your way back to Namche via the historical Himalayan settlement of Thame. Airport picks up and drops by private car/van/bus. Two night's deluxe accommodation in Kathmandu (on the arrival day and after the trekking). Domestic airport pick up and drop by car/ Flight Ticket (LUK-KTM-LUK) / domestic airport Tax. Sagarmatha National park entrance permit and fees. Trekker's Information Management System (TIMS) card fees. Duffle bag, down jacket, sleeping bag and walking pole if necessary. Hot shower during the trekking. Day 01Kathmandu (1320m) Arrival at Tribhuvan International Airport (TIA). Upon arrival at the airport, you would be received by our representative and then transfer to hotel. Day 02Kathmandu to Lukla (2886m) and then to Phakding (2640m.) We take early flight from Kathmandu to Lukla (2886m.). Upon arrival at Lukla, we would be refreshed in one of the hotels and then start our trek to Phakding (2640 m.). We trek following a gentle climb up the mountainside on the left bank of the Dudh Koshi. Nupla (5885m) can be seen in a stone throwing distance on the opposite bank. In the late afternoon, we reach Phakding. Day 03Phakding to Namche Bazzar (3440m.) Having breakfast at Phakding, we commence our trek to Namche Bazaar (3440 m.).The trail goes along the right bank of Dudh Koshi. Thamserku is standing majestically skyward on the opposite bank. We then reach Bengar. The trail now climbs from the riverbed on the left bank into the mountain, through a forest to Chumoa. We continue along the trail with many ups and downs; cross a stream, and pass by the tiny village Monjo. We then come to Sagarmatha National Park Service where a park entrance fee is to be deposited. We follow a short walk along the riverbed of this V-shaped valley where the river forks Dudh Koshit to the right Bhote Koshi to the left. Now we begin steep ascent to Namche Bazar. On the way, we would have excellent views of Everest (8848m) and Lhotse (8516m. ).Surrounded on three sides by mountain ranges, Namche Bazar (3440m) is a central hub of the area for food, trekking gears and other necessary goods. Day 04Acclimatization at Namche Bazzar We take rest at Namche Bazaar (3440 m.) for acclimatization. It is considered as an ideal place for acclimatization to the high altitude before heading towards Tyangboche. We go up to Khhumjung monastery. It is a small settlement of Sherpa community. We enjoy the splendid view of Mt. Everest, Ama Dablam, Thamserku, Nuptse, Lhotse, Tawche, Kwangde and so on from here. While returning to Namche, we would visit Museum just above the town that exhibits Sherpa culture. Day 05Namche Bazzar to Thame (3820m) Having breakfast at Namche Bazzar, we trek to Thame. It takes about 5 and Â½ hours normal walk to reach Thame from Namche Bazzar. The trail starts from the Namche gompa and leads west past a large array of prayer flags, mani stones and chorten. The carved mani stones all the way to Thame are some of the most complex and picturesque in Khumbu. Day 06Thame to Lungdeng (4500m) From Thame, we trek to Lungdeng which is situated at a distance of about 6 hours walk. En route, one can observe varieties of plants and animals, Sherpa culture and unique settlement of Sherpa people. Overnight stay at Lungdeng. Day 07Lungdeng to Yak Kharka Camp (4950m.) It is our turn to trek from Lungdeng to Yak Kharka Camp. The camp is situated below the Renjo La at an altitude of about 4950m. It takes about 4 hours to reach the camp. Overnight stay at Yak Kharka Camp. Day 08Yak Kharka to Renjo Pass (5340m) and Gokyo (4790m) Today we trek from Yak Kharka to Renjo Pass (5340m) and then to Gokyo (4790m). It takes about 7 hours walk to reach Gokyo crossing the pass. This section offers stunning views of valleys including, Kalapather and famous monastery Tangboche. High passes Renjo and Chola, glaciers, big rocks, unique villages and ever-smiling people. Overnight stay at Gokyo. Day 09Explore Gokyo Ri We would spend the whole day to explore stunning Gokyo Ri. We go for climbing the summit for having rewarding views of Makalu, Chhoyou, Mt. Everest, Bhorunche, and many others all round. After this, we return to Gokyo for overnight stay. Day 10Gokyo Ri to Thangnak (4950m.) It is our turn to trek from Gokyo Ri to Thangnak. En route you will not only see the highest mountains, deepest Georges, and beautiful Landscape but also you can enjoy the festivals and culture of ethnic groups, their way of living. The region is also the home of the Sherpas and a garden of Tibetan Buddhists with their many fascinating monasteries. We descend to the Gokyo Lake below Gokyo, then cross the glacier. We visit Yak pastures at Chhugyuma on the eastern edge of the glacier and ascend a deserted valley below the southern part of Cho-la. Overnight at an altitude of 4950m. Day 11Thangnak to Dzongla (4830m.) Today we trek from Thangnak to Dzongla. En route one can encounter boulder fields and a steep but easy snow slope that leads to the summit of the South Cho-La Pass (5380m.). One can view a flat glacier plateau with magnificent views to east and west. Later, we descend the snow -covered glacier to beautiful Dzonghla. Day 12Dzongla to Gorakshep (5160m.) Having lunch at Dzongla, we trek to Gorakshep. En route, we encounter steep, grassy hillside above the blue Tsola Lake. 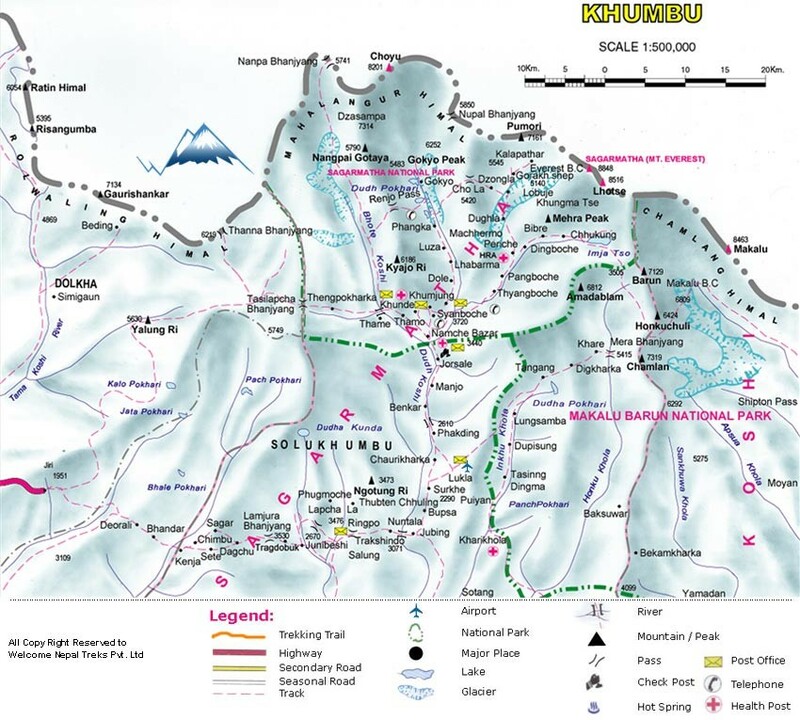 If time permits, we would go round the Khumbu valley and give a try for glacier walk. Day 13Gorakshep to Kalapatther (5550m) and then to Gorakshep We trek from Gorakshep to Kalapatther and then come back to Gorakshep. We explore Kalapatther for having magnificent views of the major eastern Himalayan peaks including Mt. Everest. Day 14Gorakshep to Dingbouche (4410m) After having lunch at Gorakshep, we trek to Dingbouche. Enroute, one can arrive at Chukkung and view attractive valley view. Besides, this section also offers close view of sacred monasteries, interaction with the hardworking Sherpa people, singing sounds of birds, big rocks along the trail and avalanche falling sound give a memorable experience for every one. In the late afternoon, we reach Dingbouche. Day 15Dingbouche to Tengboche (3900m) Today we trek from Dingbouche to Tengbouche. We start walking down to Imja Khola to and then to Pangboche. The route weaves in and out of side valleys, making small ups and downs. You can climb the hill behind Tengboche for good mountain views or explore the monastery itself. Day 16Tyangboche to Namche Bazaar (3440 m ) It is our turn to trek from Tyangboche to Namche Bazaar (3440 m ). It takes about four and half hours to reach Namche Bazaar from Tyangboche. En route we will visit traditional villages like Khumjung and Khunde. We will be visiting monastery that has Yeti Scalp. Finally, we come to Namche Bazaar in the late afternoon. Day 17Namche Bazaar to Lukla (2886 m.) Having breakfast in the teahouse at Namche Bazaar, we trek to Lukla. It is the last day of our trek. Lunch will be served on the way. Upon arrival at Lukla, we would get refreshed and take rest. Day 18Lukla to Kathmandu We board our early flight from Lukla to Kathmandu. Upon arrival at TIA, we would be received by our representatives and transfer to hotel. In the afternoon, we go for shopping. Farewell dinner will be served, a typical Nepali restaurant. While in Kathmandu, your accommodation is at standard hotels ( Attached Bath, A/C, 24 hours running hot/cold shower) similar of 3 star standard hotel and while in trek, your accommodation is at Mt. Lodge and local tea houses, they are clean and comfortable. Our entire accommodation is at twin share unless stated but single supplement accommodation is also available on personal request at the additional cost of US$- 200. Do let us know if you want to upgrade your accommodation in Kathmandu or in Major city. The meals while you are on trek are included on our package and they are taken in lodges; we will have breakfast and dinner at the lodge where we stay overnights and our will guide will choose and stop for lunch on available place every day on trek and we recommend you to bring water purification pills since you will have normal water for free, then you can have the normal water and use the medicine and drink however you have options of buying bottled water or boiled water in every places as well. There will also be farewell dinners for guests in Kathmandu. We will provide private vehicles for the airport transfers and sightseeing tour in Kathmandu and flight from Kathmandu to Lukla and return. There are electricity available in some of the villages on our Gokyo Renjola Pass Trekking where you can re- charges your camera batteries and there is solar power in some villages we trek through and you can recharges your batteries in those places as well if they have enough power and we suggest you to have spare batteries as well and you will have to pay some for recharging batteries. Your main luggage will be carried by porters on trek and you simply carry a day pack with water bottle, camera, sun-screen, spare jacket, and etc, during the trek, as small loads allows you for full enjoyment of the trek. A trek bag is ideal for your main luggage, plus a small lockable bag for travel clothes or anything that you do not need during trek which you can leave at hotel’s locker room/safe deposit box in Kathmandu for free of charge. Weight allowance at Nepal’s domestic airlines is 15 Kg including your hand bag; excess weight is chargeable at USD 1 or more which is extra on our tour cost. We provide trained trekking guide (handles the logistics and guides you and your team on the trek) and porters, a porter for each 2 trekkers and a porter carry about 20 Kg (10 Kg from each trekker) and if there are more than 10 people in the group then we will provide you additional guide for the group. Welcome Nepal Treks organize Gokyo Renjola Pass Trekking for single people to maximum 15 people at once or even if you have more than 15 people then we can split the group in to two or more groups (according to the number of trekkers) however you all can walk together and stay at same guest house and there are only different guide, and there are 1 guide up to 10 people and 2 guide for 11-15 people and a porter for each 2 trekkers. Else, join our estimated group departure dates available online or ask us with your personal dates, we will open group date on the same date. Gokyo Renjola Pass Trekking is available on both fixed departure and private basis, If you are looking for a group to join then please check our fixed departures dates and ask for availability or if you would like to travel independently, or with your friends, families & colleagues then you are invited to choose any date like every day at your convenient timeframe for any number of people. Personal expenses depend largely on your habit and as the meals are included on our Gokyo Renjola Pass Trekking cost ,so, you only need money for table drinks (alcoholic/non alcoholic beverages), snacks while walking (some smaller shops are available along the trail in the areas), tips, souvenirs, hot shower (available in some places), and meals ( A meal cost 5-7USD in Kathmandu) for your Kathmandu stay, entrance fees ( approx: 25USD) while your tour in Kathmandu, if you do not drink alcohol and sopping then 12-15USD per day should be enough for the hot drinks, shower and snacks on trek and Tips are appreciated by your support team after the trek. The amount depends on your budget and appreciation of their work. As a suggestion, we advise you to allocate 10 - 15% of the total tour cost as tips to the staff and you can do this if you feel the services have been good. It's not necessary to spend a lot of money buying equipment for the Gokyo Renjola Pass Trekking in your country as Majority of these gears can be bought at reasonable rates in Kathmandu. The best time to trek to the Gokyo Renjola Pass Trekking is spring (March to May) and autumn (September to November). The temperature is moderate in these seasons and guarantees amazing views through the trip. Although this trek can be undertaken during winter, the cold temperature might not be suitable for everyone. In case of a serious sickness or a casualty while you are on Gokyo Renjola Pass Trekking (which we believe will not happen), we will do everything to transfer you to the nearest hospital to save your life (this has happened to us few times) and you are entirely liable for all the expenses incurred in evacuation/rescue, so, please make sure that these expenses are covered by your insurance policy before assigning for the trek or be prepared to pay on your own after getting back to Kathmandu. Ensure that you’ve insured yourself before doing the trip, Common sense dictates this, it’s good for you and please visit Nepal Travel insurance page for more info about it. If flight will get cancelled, then we will reschedule your flight for the following day. (Subject to availability). However, in a group, we could also hire a helicopter to fly in/out to Lukla to start/ end the trek as per the planned date and time and cost of helicopter flight is your own expenses. Helicopter flight will cost minimum of US$- 500 per person depending on group size. To cover this helicopter flight expenses, you are kindly requested to come with travel insurance that covers the flight cancellation for minimum of US$- 500 for a day so that you could claim for the flight cancellation once returned from the trip, and we will make documentation for this as per your require to submit to your insurance. You are required to make 30% (non refundable) payment in advance in order to confirm and book Gokyo Renjola Pass Trekkingalong with your passport copy and flight detail (Arrival detail, flight name, number and time) and the remaining 80% balance is payable when you arrive in Nepal and you have options of paying the advance by bank transfer or credit card, so, do let us know which modes of payment is convenient for you then we will forward the detail for payment. In addition of Gokyo Renjola Pass Trekking, we organize extensions both within Nepal and other neighboring countries like Bhutan and Tibet of you have time and want us to arrange your extensions tours, you may do water rafting or a jungle safari, Pokhara tour or Lumbini Tour in Nepal or Bhutan or Tibet tour.